Ethics and passion in their purest form. 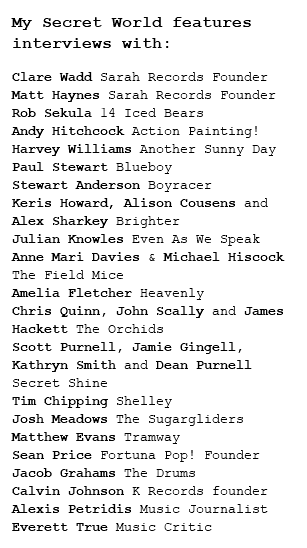 Welcome to the world of Sarah Records, active between 1987-1995, and possibly the most indie of all indie labels. This is a documentary where principles prevail and attitude and actions are just as important as the music. Heroics and belligerence, ephemeral-eternal-pop, fanzines and the incorruptible founders Clare Wadd and Matt Haynes. Their inspirations, the records, the bands, the letters, the long list of journalists that detested Sarah, the fans that love Sarah...The defiance and determination of our founding duo and and their final declaration. Their focus on something that was non-commercial and exciting, as if music could change lives and mean SOMETHING. My Secret World is a resounding reminder that music doesn’t need to be about posturing, production or money to be an outright success. My Secret World. 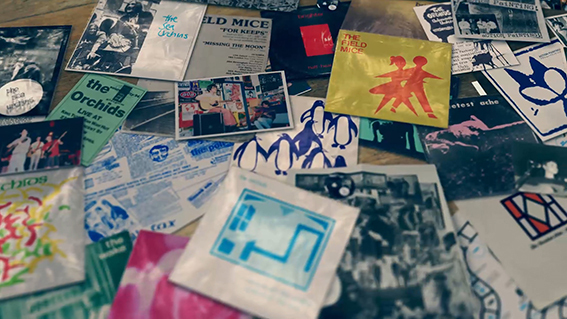 The Story Of Sarah Records is the first feature length documentary to explore this influential and often misunderstood label. Now the label founders, former Sarah band members, music critics and those that have been inspired by the label tell their story. The production of this documentary has been made possible by the generosity of everyone involved; the artists who've permitted their music to feature in the soundtrack, the interviewees for their time and help, the film makers who helped film the interviews and the Sarah fans who donated archive footage and photographs. Directed and funded by Lucy Dawkins, My Secret World has been 4 years in the making.